GPS NTP Server to synchronise the time on Windows 2000, NT and XP networks. Using time from GPS satellites ensures the Galleon,UK manufactured, GPS NTP Server is accurate to fractions of a second providing accurate time for your computer network. The Galleon GPS NTP Server will synchronise the time on Windows 2000, NT and XP networks, supplying the correct time for computernetworks. The software drivers supplied with the GPS NTP server clock can distribute the correct time across a LAN to other computers orany equipment that conforms to NTP (Network Time Protocol). Galleons GPS Time Servers provide the correct Atomic Clock Time which Windows W32TIME, or Net Time can use. Now you can make sure your computers share exactly the same time anywhere in the world. 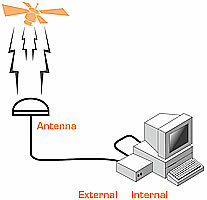 Using the GPS satellites and a GPS antennasited up to 1km (3,000 ft) away from the computer, you can be sure that your whole network is synchronised to the most accurate clock inthe world. Every second. Every minute. Every hour of every day. Software for Windows 2000, runs as a service and sets itself up as a NTP time server. Software for Windows NT, runs as a service and sets itself up as a NTP time server. Software for Windows XP, runs as a service and sets itself up as a NTP time server. All types of organizations all over the world (America, Europe, Australia, and the Middle East) are already using Galleon Atomic RadioClocks; we synchronise time across the globe for organizations as diverse as NASDAQ to Buckingham Palace. Other customers include DaimlerChrylser, 3M, GlaxoSmithKline , Kellogg's, Sharp and Shell. Provides accurate time in any location world-wide by tracking up to 12 satellites, it supplies this time to a user display and to thecomputer via a serial interface (RS232). The software driver TimeSynch NTP will synchronise the time on a single NT, 2000, or XP Server orWorkstation and can also synchronise PC's, workstations and other servers across the network using TimeSynch clients, NTP clients or W32Time. This software conforms to the Network Time Protocol (NTP) and can be set up as a Stratum 1 Time Server, so can synchronise UNIX machines andany equipment that conforms to NTP. Consists of mains powered ServerGPS Computer Clock with remote antenna up to 1,000m (3,000 ft) away, serial interface, LED time signaldisplay and power supply. Guaranteed to obtain a signal.